Most artists have been asked to do a commission piece at some point in their career. Like many things, there are pros and cons to this request. It’s always flattering to know that someone likes your art, and it’s nice to envision making some money. But one must take a deep breath and realize that creating a painting to someone else’s specifications is not always easy. So, should you or shouldn’t you? I guess that depends on your temperament, and how well you could work with someone who is not an artist but has an “artistic” vision. 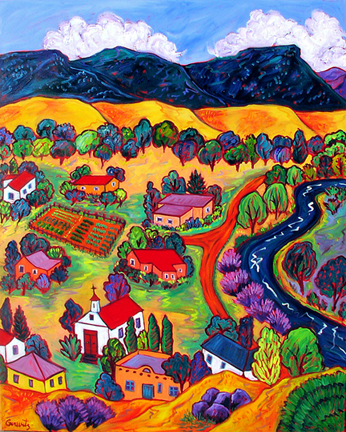 "Our Colorado Country" acrylic on canvas 48" x 84"
In the case of Stephen Morath, an artist exhibiting at Wilde Meyer Gallery, a recent commission proved to be a major undertaking, concluding in a very interesting painting. 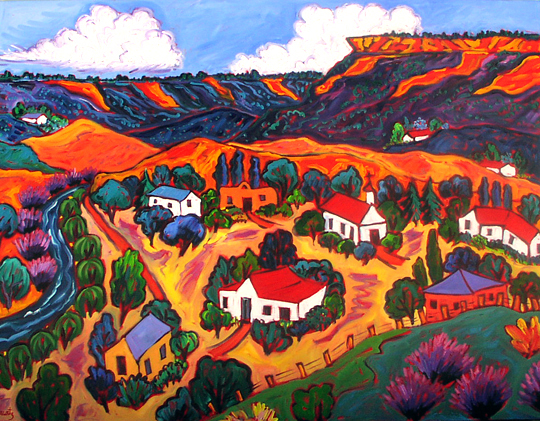 The work, entitled “Our Colorado Country,” was commissioned by a Colorado couple who saw one of Stephen’s paintings at Pikes Peak Community College in Colorado Springs. They wanted a similar painting, but requested some specific elements be added to the work. The result is a complex 48”X84” painting that depicts the Colorado landscape as well as the life of this couple. ﻿﻿If you look carefully, you can see the couple seated on a bench, looking out at the landscape ahead of them. The orange VW Beatle is a car that once belonged to the wife, who is also shown riding a horse. The two cats belong to the couple; the license plate is theirs, as is the house number on the mailbox. They like old movies; hence the movie camera next to the bench. They also enjoy old records, so Stephen added a Victrola. ﻿ So, does all of this work? According to Stephen, the couple is very happy with their painting, and while it took longer than expected, he enjoyed their collaboration. 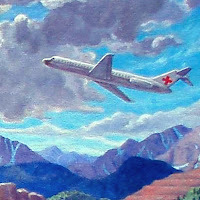 Sometimes an artistic inspiration can come from sources other than the painter himself! "Cabana Dog" oil on canvas 12"x16"
Most of my paintings include a dog. 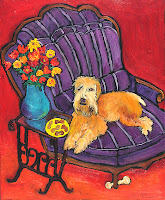 It started with Cleo, my loveable Wheaten terrier. I was painting an interior setting and I thought that she would enjoy living in a place like that! Once she was in the painting, I realized that the scene came alive, and the viewer would know that people lived there with their lovely dog. Over the years, I’ve painted many other dogs - some belong to friends of mine; others I find from images that are irresistible to me. 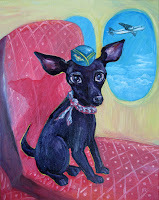 Cleo has been everywhere (in paintings): France, Morocco and in homes of my imagination. 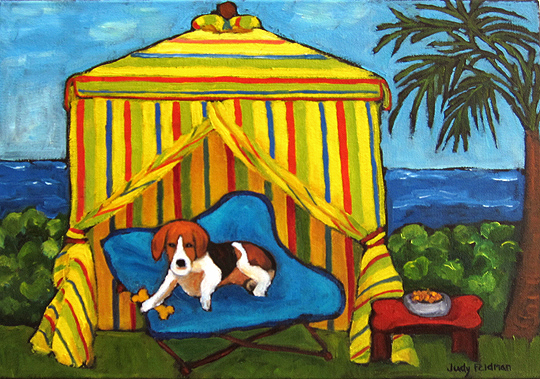 For this dog show, I painted a beagle in a summer fantasy: at the beach, in a cabana, with treats nearby. Joseph E. Young, who paints dogs in beautiful patterned settings inspired by 18th century wallpaper, feels a spiritual connection with these creatures. Red and White Cat with Puppy 36"x36"
“Each dog has its own personality that emerges from the painting,” he says. 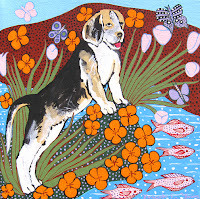 “Dogs bring movement to a painting (notice their tails), and they imply the presence of a human nearby.” Joseph also likes the decorative element a dog brings to a painting. Like me, he tries to create a world where a dog can live in harmony with its surroundings. 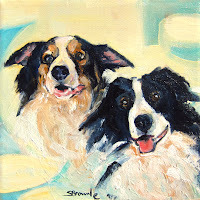 "Really" oil on canvas 8"x8"
A wallpapered room also figures in the background of a painting by Sheridan Brown entitled “Anticipation.” We don’t see what the dog is looking at, but we can surely guess it’s a person holding something to eat! I love the dangling tongue, just waiting to taste the treat. 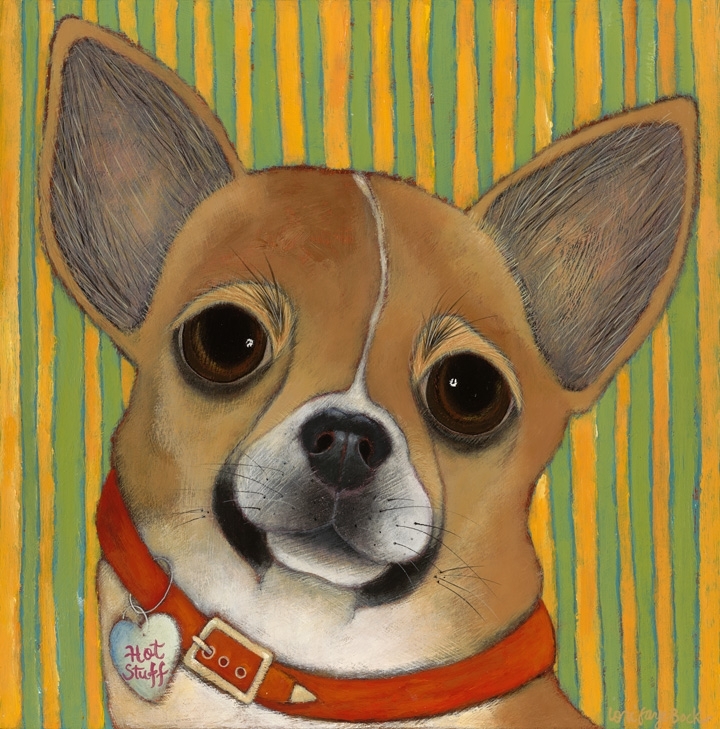 The wondrous looks in the two dogs’ eyes in her painting “Really?” have such a human expression, you can imagine them saying just that! 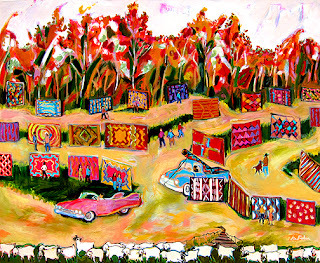 Here are a few of Sheridan's newest paintings where she captures excitement in playful imagery. "Dont Fence Me In" oil on canvas 30"x36"
Connie's dogs live in quite different surroundings –in old cars or trucks! They all like to drive and hang out of the windows with their tongues and ears flapping. She claims that if you leave a dog in a car, they will inevitably go to the driver’s seat. I tried that with Cleo, and, yep, she’s right. 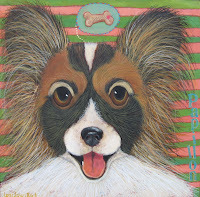 Connie says that her dog Maggie has been her inspiration in more than 100 paintings, even if she’s painting another breed. 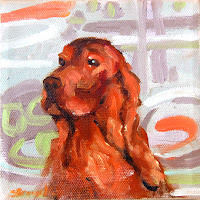 According to Connie, “A dog brings a painting to life and a smile to your face. 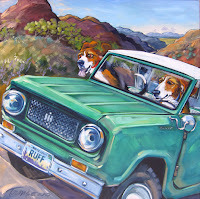 Everytime.” That certainly happens when I look at “Beagle Scout.” The two dogs driving the green pick-up with the RUFF license plate have a crazed look in their eyes, like they’re on the adventure of their lives! 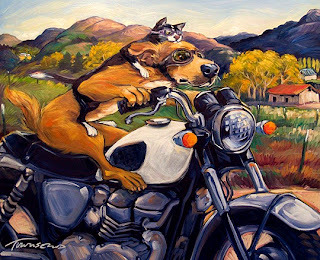 In “Don’t Fence Me In,” Connie uses another vehicle – a motorcycle – to take her dog on a wild ride, with a cat on its head. How could you not smile at that? 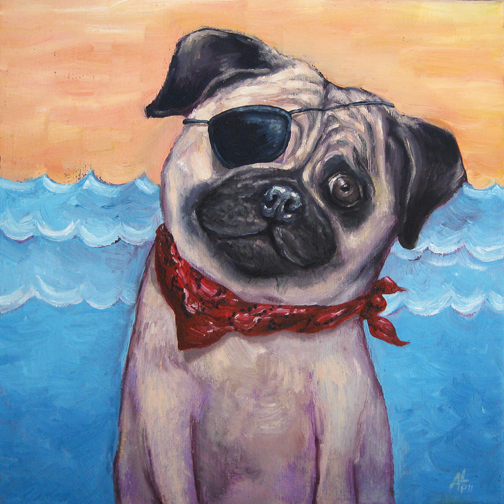 "Pugly Pirate" oil on canvas 12"x12"
Here is one of Andrea's newest paintings "Pugly Pirate". 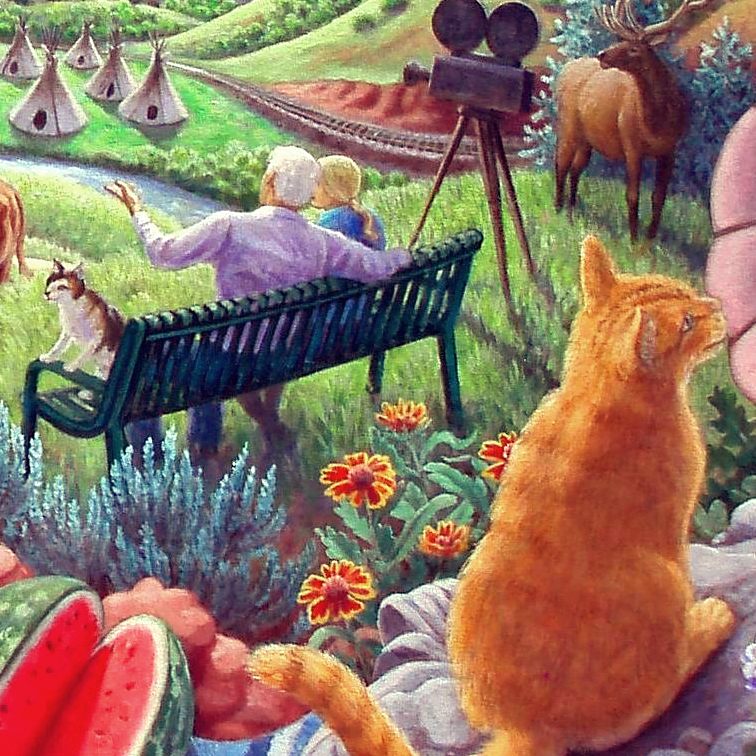 Lori Faye Bock on her farm. 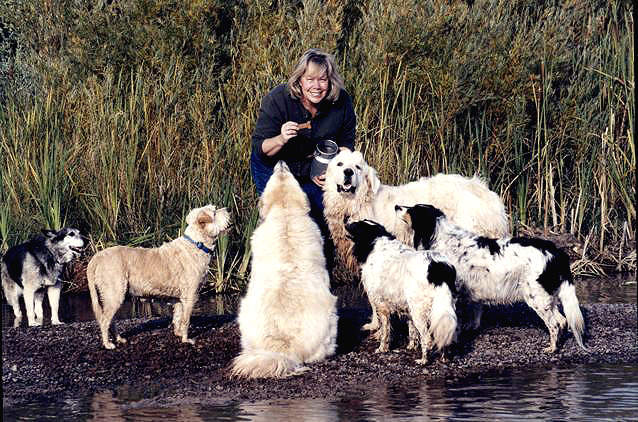 Animals are a big part of Lori Faye Bock’s life. 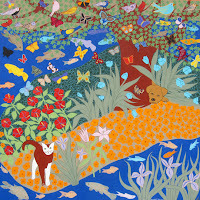 She lives on a farm with many sheep, dogs and cats. "Wishful Thinking" acrylic on panel 12"x12"
Occasionally, she paints her own dogs, but she notes that their personalities always shine through the other animals she paints. In her portrait entitled "Wishful thinking," the dog's expression suggests a strong request for a treat (with a hint from the bone image over its head)! Lori doesn’t limit her subjects to dogs. In “Protecting the Shy One,” she portrays a cow and its calf in such a sweet way – it looks like a mother and child. "Pink Pantherette" Colorado Alabaster Stone 18"x9"x14"
But I think it’s safe to say that many of us have a fondness for four-legged creatures, be they dogs, cats, cows or horses. 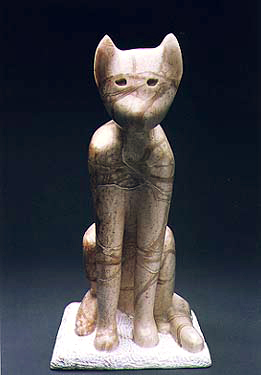 They often are the muses for the art we love to make! To see more dog days art, click here or contact us. 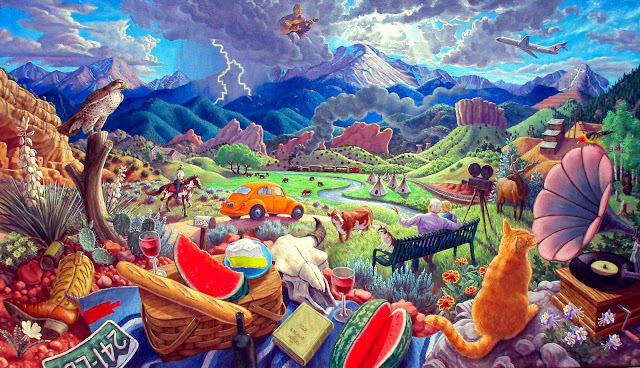 I Love the Rain 22"x32"
Yes, Scottsdale sizzles in the summer. Yes, we think twice about going out in mid-day, and everyone is jockeying for that primo parking spot under that mesquite tree. But summer is also a great time here. The restaurants are less crowded and offer many specials. The hotels offer great deals for both out-of-towners and locals who want to take a quick drive to a gorgeous resort to chill out around a beautiful pool. And, speaking of “chill,” this coming week’s Summer Spectacular Artwork is sponsored in part by China Mist Iced Teas! The July art walk is always a very cool event – if not literally, at least in the “great scene” sense. 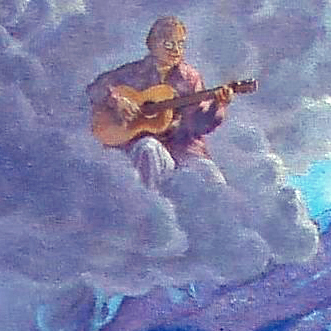 After the Rain is Over 23.75" x 23.75"
This is actually the 22nd annual event, and Wilde Meyer will be participating with the other galleries on Marshall Way and Main Street. 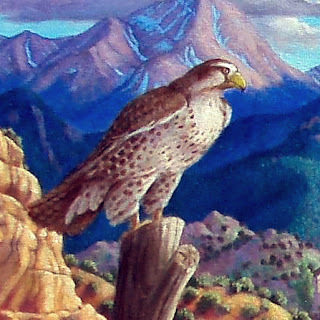 The Wilde Meyer show is called “Arizona Journey,” and it showcases diverse art by its local artists. Alix Stefan’s landscapes bring our Sonoran desert alive with bright colors. 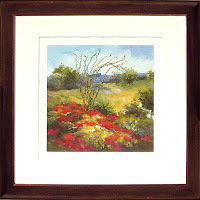 In her painting entitled “After the Rain is Over,” she contrasts a stormy setting with bright red flowers in the foreground, and the red-tipped graceful ocotillo cactus. 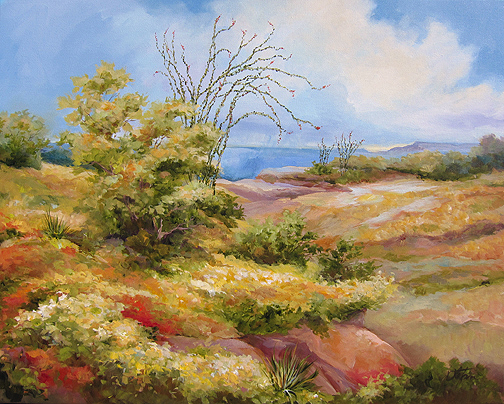 oil on canvas 72" x 24"
Nancy and Sandy Pendleton are sisters. Their collaboration is a combination of abstract painting and textured fused glass. Nancy does the painting; Sandy does the fused glass. 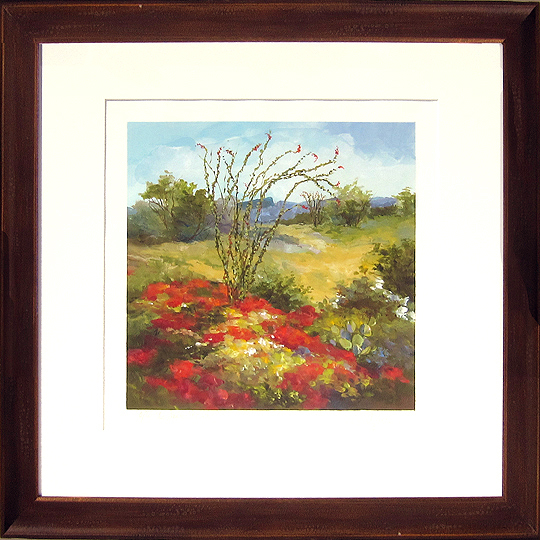 In this work, entitled “Uplifting Breeze,” a fused glass panel hovers about one inch over Nancy’s brilliant red painting. It’s mixed media at its best! 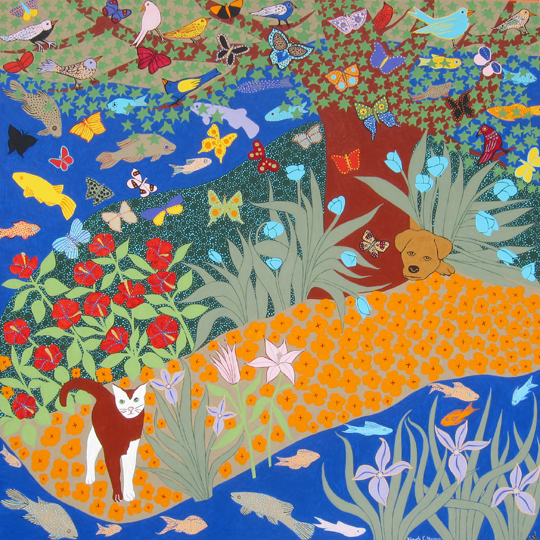 Ka Fisher’s work depicts intimate scenes of Arizona, with a focus on our Native American culture. Her loose brushstrokes, slightly abstracted shapes and unique perspective create a distinctive, expressionistic style. Sneak Preview oil on canvas 60" x 72"
I really like her painting entitled “Sneak Preview,” depicting a “pop-up” rug show at an open air site, between a herd of sheep and the forest. 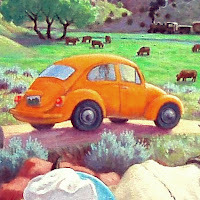 It’s such a painterly way of showing an event many of us have seen in our travels around Northern Arizona. Barbara pulls us into her paintings with a non-traditional view, often showing villages set in a valley surrounded by mountains. I think she has a charming, naïve style, but it’s not wimpy! Each painting makes a bold, exciting statement. There will be many other local artists work on display (mine, too!) at WM, and of course other wonderful art in the neighborhood’s galleries. So, mark your calendar for July 7, from 7-9 p.m. and plan to wear your “coolest” clothes!